Prerequisites: Minimum age 18, 15 with parental consent. Minimum certification: SDI Open Water Scuba Diver or equivalent, Proof of 25 logged open water dives. Please note: Equipment is not included, Lunch on boat trips costs 75.00 EGP including unlimited soft drinks, payable on the boat. TDI Nitrox Diver Course is an entry-level course for divers wishing to continue their diver education and utilize enriched air nitrox as a breathing gas to extend no decompression limits at depth. With this certification you may use Enriched Air Nitrox mixes up to 100%, for even longer bottom time but for dives not requiring staged decompression. The course builds on your basic Enriched Air Nitrox diver knowledge. The TDI Advanced Nitrox course introduces you to techniques of accelerated nitrogen elimination and the hazards of using more than 40% oxygen. You learn how to use standardized technical equipment such as wing, back plate, dual cylinders and sling tank. Please note: For extras and equipment rental contact us, Lunch on boat trips costs 75.00 EGP including unlimited soft drinks, payable on the boat. TDI Decompression Procedures is an important step further in technical diving. During this course you learn how to complete technical dives safely, using proper decompression procedures. You will schedule a dive, learn how to handle your technical equipment, and calculate increased inert gas loading. We highly recommend taking this course in conjunction with TDI Advanced Nitrox Diver. Please note: For extras and equipment rental Contac Us. Lunch on boat trips costs 75.00 EGP including unlimited soft drinks, payable on the boat. The Helitrox course examines the theory, methods and procedures for planned stage decompression diving utilizing helium in the breathing mix. Students are permitted to enriched air and helium mixes with no greater than 20% helium content. We highly recommend taking this course in conjunction with TDI Advanced Nitrox Diver as an alternative to Decompression Procedures. Please note: For extras and equipment rental Contact us. Lunch on boat trips costs 75.00 EGP including unlimited soft drinks, payable on the boat. Get the maximum benefit from your technical diver training, by taking TDI Advanced Nitrox and Decompression Procedures or Helitrox as a combined course. You will cover the same topics and dives as you would by doing the courses separately. However, as the two courses fit naturally together, the combined course may be completed in 5 days, instead of 6 days when taken separately. You will save over 10% of the price for separate courses. With this certification you may use Enriched Air Nitrox mixes up to 100%, for even longer bottom time. The course builds on your basic Enriched Air Nitrox diver knowledge. The TDI Advanced Nitrox course introduces you to techniques of accelerated nitrogen elimination and oxygen cleaning. You learn how to use standard technical equipment such as wing, back plate, dual cylinders and sling tank. Decompression Procedures is an important step further in technical diving. In this course you learn how to complete technical dives safely, using proper decompression procedures. You will schedule a dive, learn how to handle your technical equipment, and calculate increased inert gas loading. Learn how to plan and execute your own decompression dives up to 55m. This course teaches you how to prepare physically and mentally for deep air dives and how to fine-tune your equipment configuration. The TDI Extended Range course widens your knowledge of gas switching, oxygen exposure and using Enriched Air Nitrox blends for decompression. As an alternative to TDI Extended Range Diver, which uses air, this course enables you to conduct staged decompression dives up to 60m with trimix. Trimix is a blend of oxygen, helium and nitrogen. The course enables you to dive within air limits, with significantly reduced narcosis levels. The TDI Entry Level Trimix course introduces you to diving with trimix containing minimum 18% oxygen. 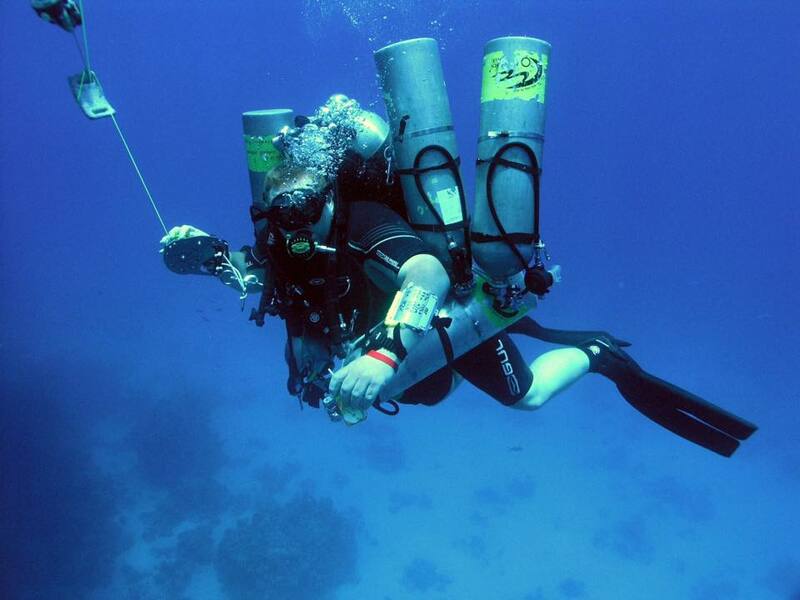 You learn how to consider both the benefits and hazards of diving with trimix. You are already a competent technical diver. This course teaches you how to plan and conduct staged decompression dives up to 100m on hypoxic trimix. You examine detailed dive planning software, risk assessment and management. You will use breathing mixes containing helium, and decompress with trimix, nitrox and oxygen. Upon completing the TDI Advanced Trimix Diver course you will become less than 1% of divers worldwide to have reached these depth limits and be this highly skilled. For more information on any of our Technical Diving Courses please do not hesitate to contact us.